Pink Pubic Hair…on a Mannequin? While I’ve heard of ladies dying their pubic hair, I’ve never heard of a mannequin with pink pubic hair before…or any pubic hair at all, for that matter. Apparently Lady Gaga likes the pink look too! She has asked for a mannequin with pink pubic hair as part of her tour contract. 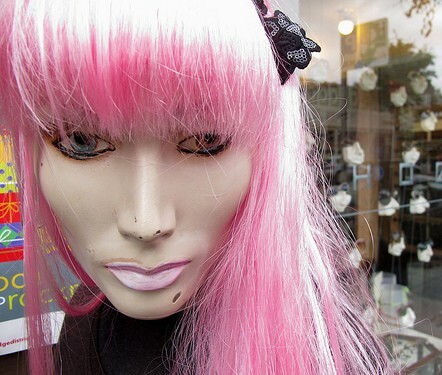 Besides more normal requests like lavender towels, hand soap, and roses, she requested a mannequin with “puffy pink public (sic) hair”. While here at the Landing Strip we aren’t too keen on the puffy look (it’s much tidier to keep things neat & trimmed down there), we’re all for trying out fun colors and different pubic hairstyles. You can try out different colors and styles to find the one you like, or even change them up to match your mood. If you’d like to try out the pink look for yourself, you can get pink pubic hair dye at Amazon.